The Sandwich Tree. That's essentially what most people (stuck in areas with few restaurants) are left with as a lunch option in the not-too-distant past. For those who are unfamiliar, the place served up sandwiches that could easily be replicated at home for a premium price. With better choices for food, this chain (and many more like it) are fading fast. The bottom line is people demand more - fresher, more refined and tastier. The people behind Two Chefs & a Table recognize this desire for better lunchtime eats and have opened up shop in a predominantly industrial area in Richmond. 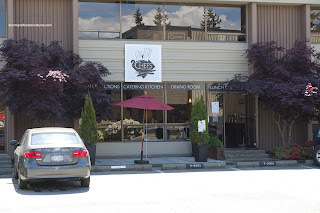 Seeing how Choobee (formerly TS from eatingclub Vancouver) and her sis were in Richmond, it seemed like a great idea to meet up for lunch at Two Chefs Richmond. Located on Viking Way, one needs to drive into a complex to find the place. It operates as both a takeout joint and a full-service restaurant. The humble exterior of the place hides a chic interior decor which is atypical of a lunch hour spot. We decided to sit on the patio at the back since it was a nice day. 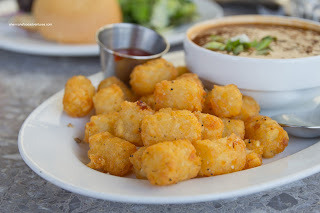 With a bit of strategic ordering (no duplicates), we decided on 4 dishes to share amongst the 3 of us staring with the Meat Hook Chili with Duck Fat Tater Tots. Due to the use of duck fat, the tater tots were super crunchy and rich. Definitely an indulgence. 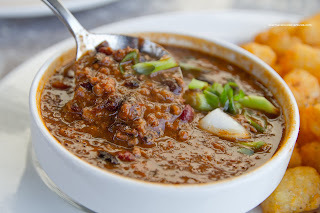 The relatively mild chili was full of meat and beans ( meat was moist while beans had a nice texture). It had depth of flavour, yet could've benefited from just a touch more spice. 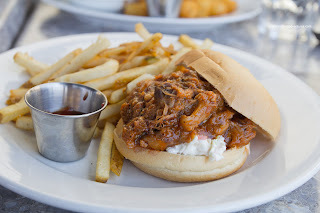 Next up was the Pulled Pork Sandwich consisting of house-smoked pork, apple BBQ sauce and Granny Smith slaw. The sandwich was messy, as it should be, with a tangy and sweet BBQ sauce. The pork was both plentiful and moist. As much as the apple in the slaw made it more interesting, it could've used a touch more zing. The bun was soft, yet still held everything together. As for the fries, they were crisp and above-average. Seeing how they had a selection of burgers, we decided to try the Butcher Burger. The house-made patty had a good char which added a nice smokiness to the meat. 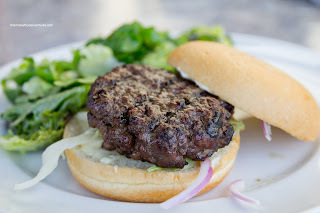 However, the meat was woefully overcooked (which was weird since the patty was pretty thick). It was not devoid of flavour though. Once again, we liked the soft bun. Last and not-in-the-least, we had the Chicken & Waffles. It seems that this is becoming the "in" dish at the moment (seems like pulled pork is just a common item now). 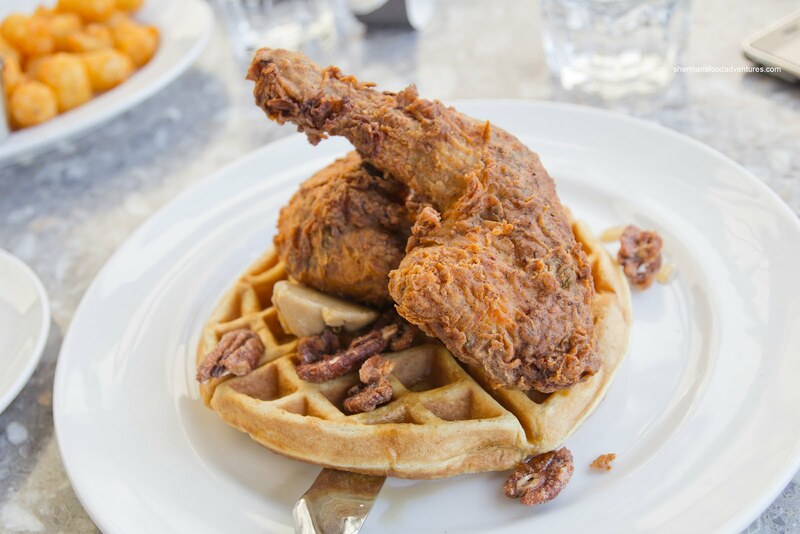 Resting atop a crispy, yet airy waffle was 2 large pieces of nicely fried chicken (leg and breast). The house made waffle was garnished with maple syrup, vanilla butter and pecans. The chicken was relatively moist with a perfectly crisp exterior. It didn't seem too greasy. One thing we would've liked to see was more seasoning used on the chicken. However, when all the components were eaten in one bite, there was a good mix of salty and sweet as well as different textures. Overall, we agreed that the food was above-average and well-priced (most dishes are around $10 - $12). Definitely something interesting in a place where one would not expect it.